We all envision the "perfect" birth, but it doesn't always turn out that way. Here's how to deal when you don't get the birth you planned. I wanted a non-medicated birth. I imagined my son crawling onto my chest and breastfeeding immediately, and envisioned how wonderful it would be—except that my birth plan was thrown out well before I got to Labor and Delivery. My son's position was transverse (sideways) and wouldn't turn, so I had to schedule a C-section. I spent the last few weeks of my pregnancy agonizing over the loss of control I felt. My experience isn't unique. Other moms I talked to had traumatic deliveries that were not at all what they planned, leaving them scarred not only physically but psychologically. "Having a C-section had never even entered my mind," says Lauren Robinson, a mom from Texas. But when her baby was face-up during labor, she ended up with one. "Some obstetricians will deliver a baby with a facial presentation, but mine felt the risk was too great to chance it," she says. "I had a breakdown." Knowing that some doctors still deliver face-up babies vaginally made her even more upset. Meredith West, a mom from New Jersey, delivered her first child in a busy New York City hospital, and was initially against pitocin, a drug that speeds up labor. But she ended up with it because of hospital overcrowding: "It was the only way I was guaranteed a room," she says. After her baby's heart rate dropped (common with pitocin's intense contractions), she had a C-section. "They told me—they didn't ask—that I was going to have a section," she says. Although her baby was OK, she was in the hospital for over a week with a high temperature and other complications. "I had postpartum depression and felt like I failed because I had to have a C-section—I even lied to some people about having one," she says. "I felt like I wasn't good enough, and most importantly like I missed out on something all moms were supposed to experience." The reasons births don't go according to "plan" are complicated, ranging from high blood pressure and placenta problems to baby's position and heart rate. Where to draw the line on proceeding with a vaginal birth and when to have a C-section isn't always clear, and may depend on your doctor's experience, hospital protocol, and specific complication. 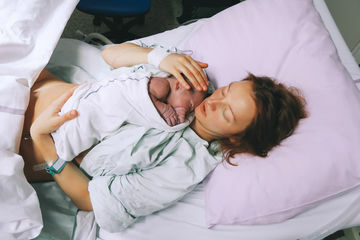 "It is important to remember that there is a limit to how much can be controlled during the birth process," says Clara Ward, MD, a maternal-fetal medicine specialist at McGovern Medical School at UTHealth and Children's Memorial Hermann Hospital in Houston. "Sometimes, despite everyone's best efforts, interventions are required in order to keep mom and baby safe." The best plan is to be flexible. "Think of your birth plan as preferences and priorities, rather than a plan set in stone," Dr. Ward says. "Think about what you would prefer if everything goes according to plan—and have a plan for when it does not." The most important thing is to trust your providers, and talk to them ahead of time about the possibilities for labor and delivery. "Women also should make certain that they have a good relationship with their midwife or doctor," says Susan Hudson, CNM, director of Midwifery Services at Cleveland Clinic. "If your midwife or doctor doesn't view the birth experience the same way you do, perhaps it is time to shop around." With new low-intervention guidelines for providers from the American College of Obstetricians and Gynecologists, "you may be surprised how much of it is already common practice, and many other requests can be accommodated," Dr. Ward says. "Ask questions and learn more about what birthing tools, such as bars and balls, and low-intervention labor techniques are available." Hudson also advises keeping as healthy during pregnancy as possible to help avoid complications. The trust and mutual understanding you build with your doctor or midwife will be crucial should things go awry. "If your pregnancy becomes complex, talk to your provider about protecting some pieces of the experience," Hudson says. "Feeling included, that your birth is yours and not 'the system's' will make you feel successful in your birth." A support person or doula during labor can make sure you're communicating and know what's going on. "Part of acceptance is understanding what is happening," Dr. Ward says. All your planning might not be for nothing if you can salvage some of your birth prep. "Part of your birth plan may include relaxation techniques, and that may be helpful in coping with the unexpected," Dr. Ward says. "See what elements of your original plan are still feasible, despite the need for medical or surgical intervention." For example, if you wanted certain music, ask if they can play your playlist during the C-section. Finally, don't let social media or the "perfect" experiences of others make you feel like you failed. "Women should not have to feel apologetic for making the choice that's right for them, whether it's by design, or when the best laid plans didn't work out," Dr. Ward says. Feeling sad is normal, but focus on how strong you were in the face of the unexpected. "When you feel as if you have been a partner in your care, even the most harrowing experience can be a good one," Hudson says. Although I still wish I could have had the vaginal birth I desired, I asked for—and received—skin-to-skin in the OR after my son was born, an experience I cherished. West says she made peace after having a more positive experience with her second child at a different hospital—even though she did have another C-section. "I love my doctor—she knew I was nervous and calmed me down," West says. For Robinson, after seeing her daughter's swollen face, she knew her doctor made the right call. "I realized I trusted my doctor's judgment and knew she wanted what was best for me and my baby, and tucked my birth plan right back in my hospital bag," she says.